Like every parent, I worry about my kid’s health. But if you asked me any of the following questions last week, I would have been unable to answer them with any confidence. Today, at least I can make a somewhat informed guess because I took the time to look at some actual data, and I made the following graph (explained below). The higher the point, the more toddlers died from that cause during the five years between 2010 and 2014 (the most recent year with data available). The more to the right a point is, the easier it is for me (the parent) to do anything about that risk (and the conditions bringing that risk). In other words, my agency increases to the right. For example, I can easily decrease the risk of drug poisoning by consistently putting all medicine well outside the kid’s reach. On the other hand, I don’t know of any way I could decrease the risk of my 2-year-old son getting cancer. Note that the agency I have in mind is not potential / theoretical, but realistic. For example, I believe my ability to decrease the risk of falling is quite small. Yes, I could completely avoid jungle gyms, and I could never let my son move freely when around stairs — and that would decrease the risk. So the potential agency is there. But it’s not realistic if I want my kid to have a normal childhood. It’s hard to say anything about the topic with complete confidence, and without a bunch of qualifications. The data comes from two sources: NEISS All Injury Program operated by the Consumer Product Safety Commission (CPSC) and Underlying Cause of Death produced by the Center for Disease Control and Prevention (CDC). I combined them because I want to be able to compare the risk of, say, influenza on the one hand, and traffic accidents on the other hand, even though one is a medical condition and the other is, well, an accident. Simplification A: My son’s demography. Although I hope this will be interesting to others, I did this visualization mostly for my own benefit. The data I used is for US-based white non-Hispanic male toddlers aged 1–4 (my son fits the younger end of that category). As a general rule, you want data that is as specific as possible. If I could make the demographic selection even more specific, I would. For example, I can only assume risks in California (where we live) are slightly different than in other parts of the States. But selecting only Californian white non-Hispanic male toddlers aged 1–4 would make the numbers too small to draw any conclusions. If anyone wants to spend the time and make versions of this graph for other demographic groups, I will happily link to them. Simplification B: My situation. Not everybody else’s. For the horizontal axis, I ordered the risks according to what I feel is our family’s agency in regards to the given risks. For example, I feel quite confident I can keep my son away from guns. We don’t own any and we live in a city where most people don’t own guns. Your situation can be different. Simplification C: Death as a proxy for health risk. The probabilities of death are small. How small? The probability that my kid gets cancer in any given year is the same as, for example, the likelihood that you and I pick any date in the 20th century and they will be the exact same date. That’s a small chance (although it’s still 25x larger than winning $25 thousand in Powerball). In most cases, I believe death is a good enough proxy to general health risk. When 56 toddlers die after being hit by a car each year, then it’s safe to assume there’s a lot more that don’t die after such an accident but suffer permanent consequences like brain damage or permanent disability. Same goes for victims of poisoning, fire, and basically all other causes of death. Simplification D: Risk is result. I plot the different causes of death on the y-axis according to the number of reported deaths by each cause. If cause A is twice as high as cause B on the graph, that’s because there are twice as many toddlers that die from cause A than those who die from cause B.
That’s not equivalent to risk, though. It doesn’t automatically follow that cause A is twice as risky as cause B. For example, let’s have a look at ‘Drowning.’ It’s way above ‘Guns.’ About 175 toddlers drown each year, while “only” 20 are shot to death (mostly unintentionally). Does it mean swimming is riskier than handling a gun? Toddlers, on average, spend much more time around water than around loaded guns. When people see a kid playing with a loaded gun, they tend to deal with it quickly. When they see a kid playing in the water, they don’t fret. In other words, if toddlers spent as much time with guns as they do in pools and baths, and if parents were okay with it, then the ‘Gun’ cross would be way above the ‘Drowning’ cross. Correcting this simplification in a systemic way is hard. I’d have to come up with some kind of coefficient that lifts causes of death that are ‘common-sense-dangerous’ (like guns) and lowers causes that are routine (like water). Such coefficient would be extremely subjective. Instead, I ask you to keep this simplification in mind and correct accordingly. I tried to cluster the data into meaningful categories. For example, a category called ‘Demyelinating diseases of the central nervous system’ in one of the source datasets doesn’t really help me make meaningful decisions. I grouped it with ‘Episodic and paroxysmal disorders’ and many other causes into one big ‘Disorders of the nervous system’ category. You may wonder what’s the difference between ‘Traffic’ and ‘Car crash.’ I put deaths that happened in a moving vehicle (toddler as passenger) into ‘Car crash,’ and deaths that occurred outside any moving vehicle (toddler as pedestrian) into ‘Traffic.’ To me, the distinction is important, because one is about car safety and second is about behavior around the road and in parking lots. What about adverse effects of vaccination? But, for the sake of argument, let’s say it’s true. Even so, the flu and pneumonia alone kill nine times as many toddlers per year (27 deaths). When you add together all the different bacterial diseases, they claim 73 toddlers each year. That’s over 20 times more than what our paranoid scenario counts for vaccines. If you’re contemplating whether or not to vaccinate your child against major diseases: do it. The NEISS dataset has a category for terrorism as a cause of death. Zero toddlers died from this cause in the observed period (2010–2014). 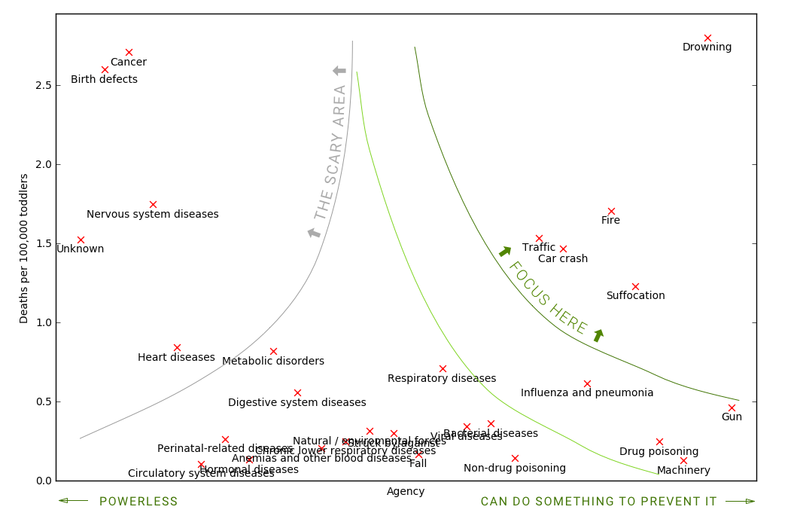 If I chose to put it on the scatter plot, ‘Terrorism’ would lie on the x-axis below ‘Circulatory system diseases’. If you think about it, terrorists would have to really step up their game to play any kind of role in this dataset. If they wanted to be as deadly as, say, ‘Machinery,’ they’d have to kill an average of 6 U.S. toddlers every year. That would mean they’d have to either kill a lot of Americans each year (and hope that some of them will be with toddlers) or actively target preschools. If they wanted to be as deadly as swimming pools and baths, terrorists would have to kill 175 toddlers each year. That’s either a targeted bombing of at least one large U.S. preschool every year (if they were only after the toddlers), or a small nuclear bomb in an American city. Every year. Always remember: terrorism is theater. Terrorists attack innocent people at well-known places because that instills terror in us. Their actual harm is negligible. In practice, there is no simple formula. Some questions are easier to answer than others. Should you spend a lot of time and money to minimize the risk of your child falling? No. Should you make sure your kid’s floatation device is securely fastened before letting them play around the pool? Yes. Anything in between is your call. Should you spend $100 extra for a child seat that claims to be extra safe? I don’t know. It depends on your financial situation as well as on how often you drive with your kid. Fortunately, it’s not all on me. I may not be able to fight cancer or diseases of the nervous system individually, but I may choose to support society’s struggle against these causes of death. Voting, supporting, campaigning, contributing time and money — all these can make a difference. Probably not for my little 2-year-old but maybe for my grandchildren and their generation. Source spreadsheet, including all the steps from raw data to output. If you care about the exact methodology, you’ll figure it out from the spreadsheet. The graph was made in mathplotlib and lightly edited in Sketch.